Words by Kevin Doocey on May 30, 2009 . I don’t think anyone who is remotely involved in football or watches it will ever forget Obafemi Martins goal against Tottenham Hotspurs a couple of seasons ago. Taking it on his left he generated as much power as he could, smashing it past Paul Robinson and luckily enough didn’t burst the net! It was a great goal and a great victory that day but now that we’re a Championship team, players must go and Oba seems the first out the door. We’re not sure whether it’s his own choice but a return to Italian football would triumph over lower tier English football you would think. Martins hasn’t scored as many goal as he would’ve liked this season but he was holding off an operation to help Newcastle’s cause. Some people think eh won’t move until January of next year because teams will wait until he finishes his operation but I think he’ll be gone come July. 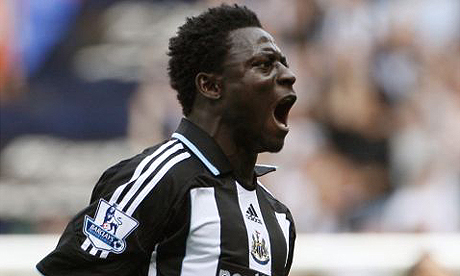 Martins was one of my favorite players at Newcastle and did brilliant in his first season with us. A price tag of around £8m -£9m is being rumored and should we get that type of money for a lad that cost £10m, it wouldn’t be bas business. We’d hopefully reinvest into younger players like Kyle Naughton, Mark Beevers etc. One thing’s for sure, I’ll never forget that goal at White Hart lane..
One of few i'll miss from our current squad.